Have you heard about Homeschool Mosaics, yet? The primary goal of Homeschool Mosaics is to support homeschoolers. Our hope is that the diversity of our writers will be a gift to the diversity of our readers. You'll have to wait until Monday, April 2nd for the big launch, but I can give you a bit of an inside scoop as a column writer. Homeschooling Mosaics is intended to be a resource that has something for everyone. Too often I see homeschoolers segregating themselves. We often identify ourselves with outside affiliations, the type of resources we use, or learning styles of our students. As a result, many of the resources available are singularly focused. However, we are all simply homeschoolers. In that, we all have something in common and can offer support for each other. While I am often interested in those homeschooling in similar situations, I also can glean a lot of ideas from others of a completely different style or circumstance. There will be new content daily at Homeschool Mosaics with column writers covering a variety of topics with such columns as The Road to College, Organized Chaos, Notebooking & Lapbooking, Teachable Moments, The Field Trippin' Mama, Closet Unschooler, Unexpected Detour, and more. There will even be regular giveaways and recipes - free stuff and food, something we can all use! As for myself, I'll be writing a column titled Uncovering the Gifts, which will focus on gifted, 2E (twice exceptional) and asynchronous learners. I will share our experiences (good and bad! ), give practical tips, and hopefully a good deal of encouragement along the way. Like the Homeschool Mosaics on Facebook, then come to the Homeschool Mosaics' Website Launch FB Party on Monday, April 2nd from 8-10 pm EST. You'll be able to chat with column writers and have a chance at winning one of the over 50 prizes given away from some of your favorite vendors. Hope to see you there! One of the things my daughter has discovered about public school is that nothing gets done when there is a substitute teacher. This came as no surprise to me, of course, remembering from my school days how I always enjoyed the break a substitute teacher would provide. Last week the teacher gave the class advance notice that they would have a babysitter substitute the next day. The last time there was a substitute, the class literally just sat there. Doing nothing. Nada. My daughter ended up playing a game on her phone to kill time. So, this time my daughter came prepared and brought her Physiology and Anatomy homeschool work with her. Why just sit there when she could actually get something accomplished? She ended up getting quite a bit of work done while warming her public school seat. I couldn't help but smirk at the irony of her doing her homeschool work while sitting in a public school classroom. You can put a homeschooler in a public school, but you can't take the homeschool out of them. And sometimes, they might just bring it along. This tween historical fiction is about seventeen-year-old Kirov ballerina Tanya in 1991, before the dissolution of the USSR. Tanya’s family is very political, especially her grandfather Georgi, who is the narrator in another book in the series, Burying the Sun (see below), but Tanya just wants to dance. When her friend Vera asks her to defect to Paris during an upcoming ballet tour, Tanya is conflicted. Should she stay and help build a freer Russia or should she go to save her own freedoms because Russia will never change? The book is an interesting discussion of patriotism and reform. What I like best about this book is Whelan’s ability to weave, not one, but two subplots into such a short novel. There is one subplot about a young girl at a shelter whose drunken father tries to sell her into slavery and another about Tanya’s boyfriend who paints a forgery of a famous Russian icon painting and attempts to sell it in order to pay for medicine for his ailing grandmother. The subplots are almost better than the main plot, which gets confusing at the end for those who are not familiar with the last days of the Soviet Union and the power struggle between Boris Yeltsin and Mikhail Gorbachev. There are few offensive elements in this book, except for the abusive father’s drunkenness and the attempted sale into slavery. These elements are handled gently, however, and should not be too shocking for the target audience. There are good potential discussion questions related to theft, lying, deception, and doing what is right even when it is difficult or scary. This is a good book for aspiring ballerinas because there are a lot of details about ballet, including ballet vocabulary. The novel contains a glossary for those who are not familiar with ballet words like arabesque. It’s suitable for ten- to thirteen-year-old students. While the book might be entertaining and educational for an older student, it is relatively short (224 small pages; more like 125 regular pages) and not as well-developed as one would expect in a book for a high schooler. I rate this book four stars (out of five). While it has a lot of great historical detail and descriptions of Russia and ballet, the ending is hollow. Tanya ends up at the Parliament Building just at the moment of the attempted coup, which is hard to believe. The details, too, are lacking, in this section. Still, if your student likes ballet or is studying Russian history, this would be a solid contribution to his or her understanding of the collapse of communism in Russia. Burying the Sun by Gloria Whelan is my favorite book in this companion series ($2.99; HarperCollins; May 1, 2007). It is set during the siege of Leningrad in 1941, when Hitler’s troops surrounded the city in an attempt to wait the citizens out. Despite great hardships, the Russians do not succumb to Nazi forces, and eventually, they find relief. Fifteen-year-old Georgi and his friends struggle to overcome cold, hunger, and the bombings. While the subject matter is grim, the story is not overly gritty. Whelan still approaches it with her tween audience in mind. One of my favorite things about this book is that it is about a period in history that few Americans know. Most know that America fought with the Russians against the Nazis, but few realize (including me!) how much the Russian people suffered. This is a great book for young students who are studying WWII (10+ years old) because it gives just enough of the facts without being terrifying. The theme of the book is the importance of finding beauty wherever one can, even amidst great suffering, and how art—both performance art and multimedia—can transform us more than seems possible. I rate this book five stars (out of five). It is one that stays with the reader long after he has closed the back cover. The children travel over 1,000 miles alone, and while this is far-fetched, Whelan makes it sound believable. Although they face obstacles—including cold, hunger, and the authorities who would place them in an orphanage, kindly strangers from all backgrounds help them on their journey. The details of Siberia are well-written and interesting. The reader learns about political prisoners as well as the nomadic life of the indigenous Samoyeds, who herd reindeer. The book includes a glossary of Russian terms to help the reader. This book is less exciting than its revolutionary companion counterparts, but it is still entertaining and well suited to tween readers who are interested in the early days of communism and Siberia. I rate this book four stars (out of five). Angel on the Square by Gloria Whelan is a popular Sonlight Curriculum title because it details the last days of the Russian Czars, a topic rarely covered in YA literature ($9.99; HarperCollins; January 7, 2003). Twelve-year-old Katya Ivanova is the daughter of Countess Baranova who has recently taken up residence in the palace as a lady-in-waiting to the Empress Alexandra, wife of Czar Nikolai II. Katya takes little notice of the activities of her family friend, Misha, who is involved in the Revolution. This historical fiction novel set in St. Petersburg in 1913 is accessible, well-written, and interesting. It would be best appreciated by students who understand some background of Russian history. Although I knew a little about the Grand Duke Alexei who has hemophilia, the story would have been greatly enhanced had I known more. Still, I learned quite a lot. Like most of Whelan’s books, the novel contains a glossary in the back to help readers with the Russian vocabulary. Later, when I repeated his words to Mama, she said, “I demanded what my papa had always asked, and his papa before him. The mansion in St. Petersburg and all the servants there took money. Papa said if you weren’t strict with the peasants, they would cheat and steal from you.” She looked down, not wanting to meet my eyes. “I was very foolish, Katya. I never thought of what the peasants suffered. How was I to know what hunger was? I only urged Vitya to send more money. I never asked how he was to get it” (Whelan 277). I rate the book five stars (out of five) for Whelan’s knack for making unique periods in history and unusual geography come alive for a North American audience and the detailed descriptions of royal Russia before the Revolution and peasant life following the Revolution. Angel on the Square is an excellent contribution to YA literature. About this time last year, we purchased my daughter (15) her own laptop. She does most of her school work using the computer, taking several online classes. It was also getting to the point that she sometimes needed to get out of our main school room and into the quiet, solitude of her own room for study. That also meant that she would need to take her computer, unsupervised, with her. While I completely trust my daughter to not visit inappropriate sites, I do worry that she may unexpectedly come upon something. I also am concerned about the distractions of the Internet. After all, browsing YouTube or chatting with friends is much more appealing than writing that paper that is due. I’ve been looking for monitoring software that provides accountability without being so controlling that it is more hassle than it is helpful. When I was given the opportunity to review Action Alert, I was cautiously hopeful. Action Alert has two versions, a Free Protection version and a Maximum Protection version. I was provided with the Maximum Protection version ($29.99), which has the following features. I opted to try this program on an extra computer used primarily by my son. The software loaded easily. Not everything went as smoothly after that. The software reset my home page to the Action Alert Safe Search, which is simply Google Safe Search. The idea is to direct and encourage use of a safe search engine and the resetting of the home page was exactly how the program is supposed to function. However, when I went to my settings, since I preferred a different home page, I could not override the software nor could I find instructions in the manual. I did eventually email Action Alert to find out how to override the home page setting and received a prompt reply. I understand that resetting the home page is just the first step of defense, but I did not find it to be very effective since the user can just open another tab and select a different search engine. The Site Blocking and the Activity Notification Alerts were the next two tools I tried. I blocked Facebook for a test run, and that did seem to work well. It didn't matter if I opened a new tab, the site was blocked. The Activity Notification Alerts are sent via email or text and are generated if inappropriate keystrokes are typed. However, there was sometimes a delay in the reporting. If you are looking for accountability, this should be fine. If you want notice for immediate action, it might not be as useful of a feature. I loved the 60 hours of recorded screen shots with the Activity Video Recording feature. Since I was looking more for accountability than filtering and blocking, this was a very useful tool. A child cannot exactly dispute their activity with a screen shot. Unfortunately, I suspect this feature, which saved a screen shot every 5 seconds (as default, users can set a different interval), contributed to a larger problem I had. My computer seemed to be running some programs very slowly. Suspecting that Action Alert was the cause of the sluggishness, I decided to remove the software. After I removed the software through the uninstall option in the program, I opened up my browser to see if things were back to normal. While the program was removed, Facebook was still blocked. The tool bar search field was also still set to Action Alert. I phoned customer service, who helped me work through the problem by advising me to clear my browser's cache. Action Alert seems to utilize browser add-ons,which are readily available for free, to block websites. Regardless, I did quickly get the information needed to get everything back to normal. While helpful to the problem at hand, I did have an uncomfortable exchange with customer service. At the closing of our phone call, my email address was requested. I declined. Frankly, I didn't see the need to supply it, especially since I had removed the software. The customer service representative seemed to have an issue with this and wanted to argue my decision with explanation that I had chosen to download the free software (unaware I was supplied the full product for review) and that the information was for their "notation". After politely declining to provide my personal information several times, I finally had to just thank him for the help on my issue and hang up rather than further engage. While everyone is allowed a bad day, I felt this exchange worth noting as I did not feel that my desired privacy required an explanation. Since my computer was back to running normal speed upon removal, I did not reinstall the software and was unable to test out the other features. Based on my personal experiences, I cannot recommend Action Alert at this time. It may be worthwhile to check back as they make improvements. If you would like to give Action Alert a try, a free version is available. The Maximum Protection, which is available for $29.99, comes with a 100% refund within 30 days if you are not fully satisfied. One of the very first homeschooling resources I was introduced to as a new homeschooler many (many!) years ago was Progeny Press. I used one of the guides that very first year. Since then I’ve picked up guides used when I’ve come across them to have on hand. Progeny Press guides are literature guides from a Christian perspective. They are a mix of vocabulary work, comprehension questions, reflective thinking exercises, and related Bible study material. Progeny Press study guides are designed to help students better understand and enjoy literature by getting them to notice and understand how authors craft their stories and to show them how to think through the themes and ideas introduced in the stories. In addition to the book title, students will also need a dictionary, a thesaurus, and a Bible (the guides use the NIV translation). I was excited at the opportunity to select guides for the middle and high school levels since my exposure to Progeny Press has been mostly at the grade school level. 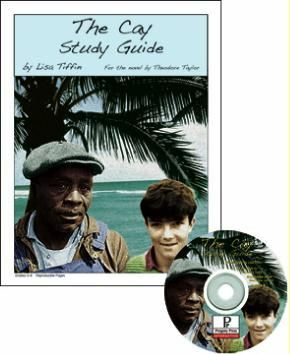 My son selected The Cay Study Guide, for grades 5-8. My daughter selected The Screwtape Letters Study Guide. I received the PDF version for both of these guides. The study guides are intended to take between 8 and 10 weeks to complete. Each guide gives a synopsis of the novel, information about the novel’s author, background information pertaining to the time period and/or circumstances of the novel, and suggestions for pre-reading activities. The remaining sections are broken down into small portions of the book, covering up to several chapters. Each section starts with vocabulary work, then moves in questions taken directly from the reading. Next are questions that fall under the category of Analysis (for the high school guides) or Thinking About the Story (for the middle school guides). These questions are more reflective questions based on a story topic, event, or theme. For the middle school guide, this section also contained literary terms. The category of Digging Deeper is next, with use of Scripture to answer many of the questions. Suggestions in Optional Activities includes projects, essays, and exercises applicable to the reading. The studies are concluded with a overview and/or essay suggestions. Most, though not all of the Overview questions in The Cay Study Guide have a focus on the elements of the story, story structure. The final project suggestions include 1-2 page papers of various topics, presenting a speech, conducting interviews and writing a mock newspaper article, and even art projects. 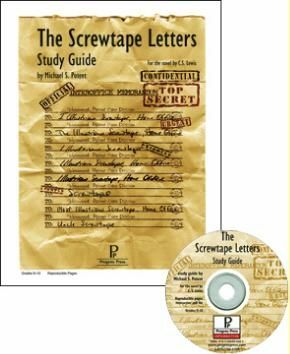 The Screwtape Letters Study Guide gives suggestions for paper topics varying in length from 2-4 pages to 8-10, in addition to a few creative project suggestions. Answer Keys are included with each guide. While answer will and should vary for some of the questions, the Answer Key will give general themes and key points in order to best direct your student. The samples below will give you a very good feel for vocabulary covered and the level and depth of the questions. A new feature to Progeny Press study guides is the interactive PDF. I’m typically not a fan of PDF products. I like to flip through the pages and hold the book in my hand. This worked just fine when I was working with younger children and doing most of the work verbally. However, the interactive PDF version, which allows answers to be typed directly on the PDF, has some advantages to the printed product. Both of my kids prefer typing to writing. The ability to type answers directly on the file certainly keeps things more organized. The vocabulary questions are often multiple choice or matching; the interactive PDF allows the student to select the answer with a drop down box. There is no need to print out questions and then file the completed sheets. Instead, everything can be completed and saved directly on the computer under a different file name. The interactive PDF really does make completing the work easier and is a real plus with students that are able to work independently. The recommended pace is to work on one page a day. For high school level work, one guide is equivalent to about 1/4 credit. It is suggested that the student read the novel in its entirety before going through the guide. This perhaps gives the student a better big picture of the book and allows them to go deeper when going back to study sections of the book. However, both of my children, and my son in particular, don’t care to go back to think and reflect on chapters after they’ve read the book. The preference is to do the study while actively engaged in reading the book, wondering what will happen next, and more “in” the story. You may want to consider your student’s preference before starting a guide and adjust accordingly. Overall, Progeny Press Study Guides are very nicely done and serve as an excellent vocabulary, literature, and Bible study all rolled into one. Flexibility is offered with optional activities, both creative and more academic. Depending on the selected Optional Activities, a fair amount of writing work could be added to stretch and round out the study. Both The Cay Study Guide and The Screwtape Letters Study Guide are offered in the interactive PDF version, either on a CD or as an email attachment ($16.99 and $18.99 per title respectively), or as a printed book ($18.99, $21.99). You can also get a combo package of both the printed guide and PDF ($21.99, $27.99). As a convenience, the novels are also available for purchase. Active military families are extended a 15% discount. My personal preference would be the combo package since I still prefer a printed book, but the interactive PDF provides enough conveniences to have both. Progeny Press sells Study Guides for Lower Elementary through High School, as well as series of Creative Classic Scripts and Additional Resources. Watch out, parents. Someone is out to get your kids. Over $17 billion dollars a year is spent on advertising directed at children. That is a scary number, isn’t it? It is estimated by the AAP (American Academy of Pediatrics) that the average child sees 40,000 commercials each year. Marketers are taking full advantage of each and every commercial to influence young minds. What appealed to me most when I heard about The Art of Argument, the first of three-book series by Classical Academic Press, was the teaching of informal logic through the use of 60 phony advertisements. It gives familiarity and allows instant application of what has been learned in the text, possibly up to 40,000 times a year! 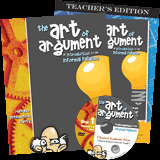 My review package consisted of the Art of Argument student text , the Teacher’s Edition, and a sample of the DVD Set. The Art of Argument is geared toward middle school students. It covers 28 informal fallacies in a workbook format with a text reading and a series of questions to answer for each lesson. I suggest that you check out the 51-Page Student Sample and the 46-Page Teacher Sample, which will give you a very good idea of the structure and format of the curriculum. The curriculum starts with a thorough explanation of informal logic versus formal logic and the difference between arguing and quarreling. Three key areas of critical thinking - relevance, presumption, and clarity – are also discussed as a foundation prior to covering the actual fallacies. While the text is a workbook format, I wouldn’t necessarily call it dry. Similar to other products by Classical Academic Press, there is a fair amount of humor injected into the reading and exercises to round it out. In addition to the phony advertisements, students will find skits, dialogues, real-world applications, and more. I appreciated that the Teacher’s Edition has the entire student text and answers within its pages so the teacher doesn’t have to look back and forth from the student’s material. It also includes a variety of tests and quizzes. The DVD lessons are supplementary to the text and not necessary, but helpful. Each lesson is a discussion of the material with two teachers (Joelle Hodge and Chris Perrin) covering the material with four middle school aged students. The DVD lessons would be most effective if watched after your student covers the text material for that lesson. I’ve found other Classical Academic Press products to be well-done and Art of Argument certainly follows suit. It is very each to use and organized. Since my son is in 7th grade, I don’t often read his lessons to him. However, I opted to read each lesson together and discuss each question rather than have my son write out answers and explanations. This allowed him to focus on the material rather than writing tasks. It is certainly a program that could be done with independent reading and question answering followed by further discussion, if needed. Before we even got out of the introduction, my son was seeing weaknesses in some arguments he was trying to make earlier in the day. With a 12-year-old boy and a 15-year-old girl in the house, there is plenty of opportunity to analyze whether something is what I call stinkin’ thinkin’ or if it is a valid argument. Of course, the critical thinking skills taught in the Art of Argument will serve your students well beyond sibling squabbles.While I’m sure my son is just waiting for the next opportunity to say, “That is an ad hominem fallacy!” to his sister, I appreciate the skills he’ll be learning to apply to other academic subjects and encounters in life. The Art of Argument is available for $21.95 at Classical Academic Press. The Teacher's Edition is available for $24.95 and the DVD set $54.95. I highly recommend that you don’t go without the Teacher's Edition. The DVD set is a nice addition, but not necessary for the program. You can also purchase all three items in a bundle at a savings for $88.95. I picked up Bog Child by Siobhan Dowd ($6.80 :David Fickling Books; 2008) in the Teen Department of our local library, but I question if it should not be shelved in the Adult Department instead. The book is about eighteen-year-old Fergus McCann, a strong physics student studying for his A-Level exams to get into the university in Aberdeen in Scotland. The story is set in Northern Ireland in the 1980s, when there was a lot of violence—known as “the Troubles”— between the UK-occupying force and transplants to Northern Ireland (United Kingdom Protestants, mainly) and the Republic of Ireland and those loyal to their cause (independent nation, mainly Catholic). While stealing some peat along the border (to burn in the fireplace), Fergus and his uncle discover what appears to be the body of a young girl in the bog. Meanwhile, Fergus’ brother is in on a hunger strike in prison as a result of his activities with Irish nationalists. First, the positives: the story is well-plotted. There are several subplots and these are woven together in an unusual way until the surprising climax. The story is interesting and engaging. The characters are well-developed and believable, and the protagonist faces real moral dilemmas. The descriptions of the landscape are vivid. Moreover, the story has a real Irish flavor. The dialogue is true to life, as is the vocabulary. This “realism” has a downside, however, and it is that the book is so well-seeped in Irish vernacular and culture, that the average American will have difficulty understanding it. I am of Scottish descent (my mother is “straight off the boat”), and I struggled a lot with some of the vocabulary in this book. A teen with no UK background will flounder. The author assumes her reader knows all of the Irish situations and slang. For example, the beginning of the book talks about JCB and a JCB man. I still don’t understand what this acronym means. There are many instances like this. Perhaps the book was intended for Irish teens? Clearly, it was not written with a North American audience in mind. In addition, there are other adult elements. The “bog child” Fergus discovers has been hanged, and the noose remains around her neck, only mildly decomposed because of the nature of the bog. Mel, the bog “child” who turns out to be a dwarf, “speaks” to Fergus in his dreams, so the reader learns how she died. It is an interesting story of love and sacrifice, but a little new age and macabre, too. This morbidity is mirrored by Fergus’ brother Joe who is on a hunger strike and slowly starving to death. These are grave, realistic situations that make me question if this book is appropriate for readers under eighteen. Lastly, there is a lot of excessive drinking and “funny” stories of drunkenness. While I understand that drinking alcohol is legal in the UK at eighteen years old and so it is not taboo to have an eighteen year old pulling a pint, it is never constructive to have main characters drinking to excess in a teen novel. While I enjoyed this book, I am hesitant to grant it any more than three stars (out of five) because of the inappropriate subject matter for younger teens and the difficulty most American readers will have in sorting out the situation in Northern Ireland. I would consider it only for your oldest and most mature students and as an opportunity to discuss your family’s feelings about pre-marital relations and other moral dilemmas. It would help if the student prepared by reviewing the conflict in Northern Ireland before reading the book. Still, it is an interesting novel, with real-life moral dilemmas: Would you help a cause you disagree with to save your own family? To save innocent acquaintances? What if that cause hurts potentially hurts other innocent strangers? Who do you trust? Do you allow a family member to do something destructive to them if they do it knowing the consequences? Is starving oneself suicide? Why or why not? It would make a good discussion book for a parent and an almost-adult student. *This review includes affiliate links. A couple of years ago I reviewed a product called Mathletics. You can read the review here. My son enjoyed this program enough that we continued our subscription after the review period. Each year this organization hosts the World Education Games. It is a free spelling, math, and science competition that your kids can join and compete with other countries. There are even prizes to be had! Unfortunately, it has already started, but there is still time to get in on World Science Day tomorrow! It is a perfect opportunity to set aside your regular science studies for the day and have a little healthy competition. Initially, I selected Letters from Rifka by Karen Hesse ($6.99; Square Fish; 2009) because it had won the National Jewish Book Award and was written by a Newberry Award-winning author, so I figured it must be good. I was disappointed. The story itself is interesting enough. A twelve-year-old Jewish girl Rifka and her family are fleeing persecution in Russia in 1919 for America, where her three oldest brothers live. En route to the ship, Rifka contracts ringworm and must stay behind with a foster family in Belgium until her scalp heals, which takes nearly a year. Spoiler alert! Rifka eventually sails to America over stormy seas only to be quarantined on Ellis Island for weeks. She learns languages quickly and becomes an interpreter to the medical staff, as well as a friend to an orphaned Russian peasant boy. In the last chapter, she is reunited with her family. The book is based on the author’s great-aunt’s life story, so the story must have a lot of accurate elements, but I am not familiar enough with this time period to give an opinion. The book has very little violence (the description of her uncle being shot and killed in a flashback), only mild love interest (a benign kiss from a cabin boy), and mild sexual innuendo (soldiers leering at women who are forced to strip for medical examinations). Overall, it’s a fairly sweet story with just enough danger and suspense and a happy ending that most young girls, 10 -13 years old would enjoy. Sadly, I had three major quibbles with this book. First, if the reader has not studied World War I European history, the story can be confusing, especially at the beginning while the characters are still in Europe. For instance, the protagonist makes references to “pogroms,” a rioting against the Jews in Russia, without explaining it to the reader. There are several Jewish, Yiddish, and Russian terms and no glossary to turn to for help. Also, there is the consistent use of acronyms, such as HIAS, which is explained only once in the beginning (Hebrew Immigrant Aid Society), and not in detail, but then repeated often later in the book. I have had some WWI European history, and I struggled to understand exactly what was happening between the Jews and the Russian peasants at the beginning. A young student with no background would likely be lost. Secondly, the story structure is confusing. Rifka’s cousin gives her a book of Pushkin’s poetry. Rifka uses the blank pages and the margins to write “letters” to her cousin, sort of a journal that she does not mail. (At the end, Rifka considers mailing the book back to the cousin with the letters inside, but the reader does not see this happen.) The structure is strange, and somewhat hard to comprehend. amidst the cares, the woes, and the vexation... (Pushkin). How many fourth or fifth graders do you know understand the meaning of the words “elation” and “vexation”? How about “exile”? Thus, while the story is based on historical facts and contains some realistic elements, it is not entirely appropriate for the target audience. Perhaps Jewish children would have more familiarity with some of the terms or cultural elements and, thus, enjoy the story more, but I think even they would struggle with the poetry. Thus, I give the book three stars (out of five) for failing to meet the target audience’s needs. Just because some think we are crazy for homeschooling our children, our homeschool shouldn't feel that way! Yet, if we homeschoolers are honest with ourselves, many of us often wonder if we’ve lost our sanity while doing this thing called “homeschooling”. 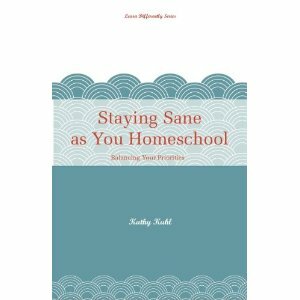 Staying Sane as You Homeschool is the first booklet of a new series written by Kathy Kuhl of Learn Differently. This series will consist of “short, practical books to help you focus on your goals, encourage your children, and stay the course.” It makes sense that the very first topic would be about maintaining peace of mind while homeschooling. Kathy Kuhn comes right out of the gate in Part 1, Are You Sabotaging Your Homeschool?, and addresses one of the most important influences on our homeschool – our attitudes. Are we locked in to a certain method or vision of how our school should look, what our kids should be doing, and when things should happen? Kuhl exposes the comparison trap many of us fall into, whether those comparisons are against others or our own internal expectations. Once attitude adjustments are addressed, Part 2, Balancing Your Priorities, gives practical advice and encouragement with tips on taking care of ourselves emotionally, spiritually, and physically, planning and finding support for our homeschool, and maintaining healthy relationships. Those teaching kids with different learning needs will benefit from the tips geared toward to this area. Scriptural references are also included. However, neither of these perspectives is overwhelming, and this booklet has sound advice that is applicable to homeschoolers of all types and circumstances. At 44 pages, this first booklet in the Learn Differently Series is a quick read for busy homeschool moms. It zooms right in on obstacles that stand in our way to keeping peace and contentment in our homeschool and delivers a big dose of encouragement. 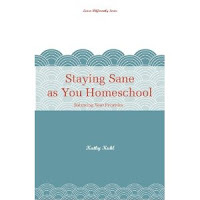 Staying Sane as You Homeschool is available at Amazon for $5.95. Disclosure of Material Connection: I received one or more of the products or services mentioned above for free in the hope that I would mention it on my blog. Regardless, I only recommend products or services I use personally and believe will be good for my readers. I am disclosing this in accordance with the Federal Trade Commission's 16 CFR, Part 255: "Guides Concerning the Use of Endorsements and Testimonials in Advertising. This review includes Amazon affiliate links.